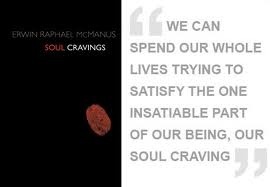 We all have cravings: deep seated desires and needs that must be fulfilled. We only need air, water and food to survive, but we need love, community, hope, security, purpose and value to truly live. Erwin McManus, author of Soul Cravings, has grouped these most fundamental human cravings into three areas, the need for intimacy, destiny and meaning. What do you crave the most? Confidential communication with online mentors are available.